Joy De Vivre Design: Is This How Grown Up Princess Rooms Look? We have all seen the little girls rooms themed with Disney Princess bedding and pictures. Well imagine that little girl in 20 years. What will she have then? has thought about the grown up princess and designed bedding just for her. And let me add it is pretty darn beautiful, but oh so pricey! This is the Ribbon Loop design. The colors are so vivid! Oh the Fuchsia! If I were Rachel Zoe I would be screaming "I die" right now! Actually my husband would probably die if I ordered it. It is 400 pounds and since I am not planning on actually owning it I will not bother converting that into dollars, but whatever it is I know it is too much for someone whose pup sleeps on the bed. I could just imagine Barkley taking a rawhide up there and Gabe having a heart attack. 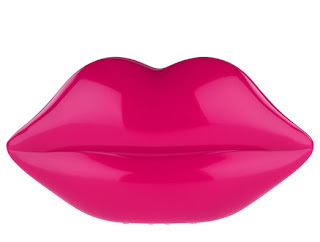 Since I do not own a defibrillator I shall also never own the Lulu Guinness Pure Silk Bedspread in Fuchsia. That comforter looks like heaven!